HAS DEPOSIT! 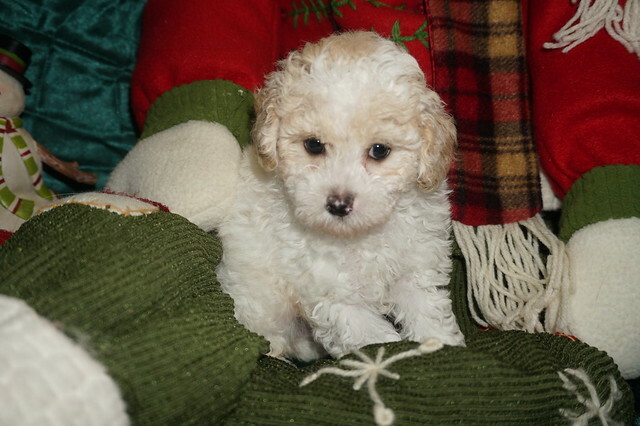 Eli Gorgeous Male CKC Poodle Ready To Steal Your Heart! HAS DEPOSIT: CONGRATULATIONS FRONRATH FAMILY! Waiting on my new name and my new home is Florida. What a cutie pie. H e has been prayed over for finding his forever home . ELI is the only male in this litter of two and he is so sweet! Litter Theme is names starting with E’s since mom is Emma. Just look at his gorgeous white color with cream gold markings on his face (because he has parti poodle in his back ground) that is sure to steal your heart. And his adorable docked tail will make you giggle every time he wags it. His gorgeous curly hair is so soft hair will entice you to run your fingers through it. Mommy Emma is a 7 lb Poodle and daddy Chili Pepper is a 6.8 lb Poodle making him a gorgeous toy poodle. So his estimated adult weight is 6-8 lbs. « HAS DEPOSIT! Chili Pepper Male Parti CKC Poodle A Real Looker!